4P 3FT 6FT 6FT 10FT High Quality, Premium Nylon Braided Charging Cords. Various length for using on sofa, in bed, in car and some other places. The bundles of the make your life more convenient. Sync and Charge at fast speeds on your devices. Our technology teams make thousands of tests to ensure 100% safety for. Durable nylon fiber cloth for protection, strength and flexibility ensuring long-lasting performance.Holds over 4000 bends in lab tests which is 10 times longer than original device cables. The Phone charger cable with super quality, we provide 12-month Warranty. 24/7 friendly customer service will solve all your problem. 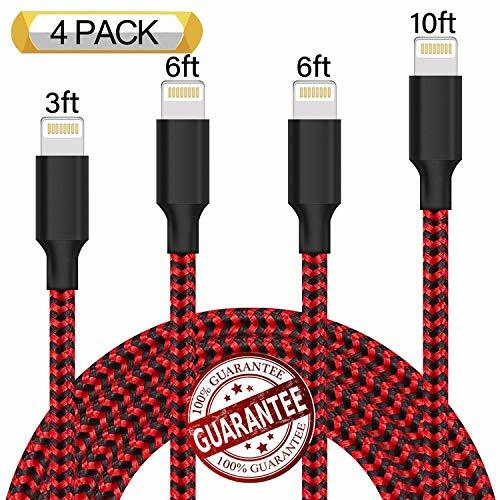 PERFECT COMBINATION: 4 Pack in assorted Lengths (3FT, 6FT, 6FT, 10FT) are great replacement for the standard cables and very useful for different occasions. Make your life more convenient. EXTRA DURABILITY: Highest standard of quality cables, Covered with braided-nylon jacket and aluminum shell which is more durable and sturdier than the normal. Holds over 5000 bends in lab tests but also flexible and tangle-free. SUPERB PERFORMANCE: With built-in safety proctections and four-core copper wires promote maximum signal quality and strength. Ensure a maximum charging speed up to 2.1A, charge faster than most standard cables and work better for speed. COMPATIBILITY: Fast charge & sync compatibility with Phone 8 / 7 Plus / 7 / 6s Plus / 6s / 6 Plus / 6 / 5s / 5c / 5. SERVICE & WARRANTY: Every sale includes an 12-month, worry-free guarantee to prove the importance we set on quality. Please contact us with any question or concern by email - we are always be here for you. If you have any questions about this product by Zcen, contact us by completing and submitting the form below. If you are looking for a specif part number, please include it with your message.